The Human Rights Report card on Cameroon by the US State Department could be the same smooking gun the US could use to “refer the separatist conflict in Cameroon to an international forum”, (ie the International Criminal Court or UN Security Council). You can read damning excerpts of the US State Department Report on Cameroon for 2018 here. “Government security forces were widely believed to be responsible for disappearances of suspected Anglophone separatists, with reports of bodies dumped far from the site of killings to make identification difficult. According to credible nongovernmental organizations (NGOs), the government did not readily account for some of the activists arrested in connection with the Anglophone crisis. missing individuals’ location in detention for a month or more. For example, authorities held incommunicado Ayuk Sisiku Tabe, the “interim president” of the so-called Republic of Ambazonia, along with 46 other Anglophone separatists, from January 29 until late June when they were allowed to meet with their lawyers and the International Committee of the Red Cross (ICRC). NO CRIME IS PERFECT. THIS COULD BE THE SMOOKING GUN THAT WILL BE USED TO REFER THIS MATTER TO AN INTERNATIONAL FORUM. SO STAY TUNED. This year’s edition of the Cameroon Film Festival, Camiff has been cancelled due to the growing insecurity in the Anglophone regions. The festival was initially take place in Buea from the 22 – 27 April but the security situation in city has now forced organisers to cancel the event. The founder of Camiff said the event was cancelled after proper consultation with local Government authorities, the police and Embassies and it became clear the crisis affecting the Anglophone regions will make it difficult for participants to access Buea. “Our International celebrities have been advised by their governments and security teams to avoid visiting Cameroon at this time,”Agbor Gilbert Ebot said. “We did attempt to come up with an alternative date but sadly we were advised that this would be too impractical for both sponsors and partners as we cannot foresee a break or an end to this ongoing saga in 2019. The event has thus been postponed to April 20-25, 2020 with all submissins for this year carried forward to next year. The European Union has called on the government of Cameroon in engage in an inclusive dialogue with all parties as the only solution to the current political and security impasse in the country. In a statement released by Federica Mogherini on behalf of the EU, the body tasked the government of Cameroon to free all the supporters of the Cameroon Renaissance Movement arrested and detained over a month ago. “The arrest and prolonged detention of several leaders of an opposition party, including its leader Maurice Kamto, and a large number of protesters and supporters, as well as the opening of disproportionate proceedings against them military justice, increases the political malaise in Cameroon. The rule of requires fair justice and the release of detainees against whom (incriminating) evidence can not be presented , ” Federica Mogherini said. The EU representative also touched on the violence in the North West and South West regions of the country describing the situation as unacceptable. ” The persistence of violence and human rights violations in the north-west and south-west regions of Cameroon has resulted in an unacceptable number of casualties and a heavy impact in humanitarian and economic terms. ” The emergence of ethnic-based hate speech by some media and political actors, most recently a member of the government, is an additional factor of concern. ” The response to the important challenges facing the country can only be achieved through an inclusive political dialogue and in a context of respect for fundamental freedoms and the rule of law. This is also the foundation for the partnership between Cameroon and the EU, for the benefit of all Cameroonians. The EU will support any initiative in this direction. The Vatican has offered its services to help mediate in the conflict that has been ravaging the North West and South West regions of Cameroon since 2016. The offer was made on Monday by the Secretary in charge of Relations with State at the Vatican Mgr Paul Richard Gallagher during an audience granted him by the Minister of External Relations Lejeune Mbella Mbella on the sidelines of the UN Human Rights Council in Geneva. The Vatican said it was deeply concerned with the situation in Cameroon and is ready to help the country seek a lasting solution to the crisis. The audience that lasted for 45 minutes also saw both men discuss the relations between the two states as the Vatican promised to continue to help Cameroon in the sector of education. The United States will withhold military assistance to Cameroon over allegations of gross human rights violations by its security forces in the northwest, southwest and far north regions, a state department official said on Wednesday. According to the official, the US had terminated a C-130 aircraft training program, and halted deliveries of four defender boats, nine armored vehicles and an upgrade of a Cessna aircraft for Cameroon’s rapid intervention battalion. Furthermore, the United States had withdrawn its offer for Cameroon to be part of the State Partnership Program, a military cooperation program, the official said. We do not take these measures lightly, but we will not shirk from reducing assistance further if evolving conditions require it. Cameroon has cooperated closely with the United States in the fight against Islamist militant group Boko Haram in West and central Africa. But rights groups have accused authorities of using the fight against Boko Haram to crack down on political opponents, and make arbitrary arrests and torture people. Authorities arrested opposition leader Maurice Kamto in January, accusing him of mobilizing dissent against President Paul Biya, who has ruled the country since 1982. Biya has been accused by the opposition and rights groups of cracking down in the Anglophone Southwest region to root out armed separatists trying to end his grip on power. Tens of thousands of people have been displaced in Nigeria and neighboring Chad, Niger and Cameroon during Boko Haram’s campaign to carve out an Islamic caliphate in northeast Nigeria. “We emphasize that it is in Cameroon’s interest to show greater transparency in investigating credible allegations of gross violations of human rights security forces,” the State Department official said. The Central African country of Cameroon—whose tourist slogan for years was “all of Africa in one country”—presents itself as a unifier of diverse environments, languages, and culture in this nation located in the middle of the continent. The last weeks in Cameroon, however, suggest the worst of conflict, corruption, and colonialism, primarily relating to the country’s intensifying repression against the English-speaking minority in the region of Ambazonia, little-known even to Africanists and anti-colonial academics from the Global North. Despite the efforts of Ambazonian scholars based in the U.S., and a trickle of not-always-helpful information from Amnesty International and the BBC, the escalation of military violence over the past few months, and especially a new “scorched earth” burning of entire villages since last May and several massacres in the first half of July, have gone largely unnoticed even by human rights experts. On the evening of July 11, 2018, five students were separated during a round-up by government military forces at the University Center in the town of Bambilli, allegedly for not having identification cards. Bambilli is a college town north in the Ambazonian territory. Though BBC reported on the incident, they did not make the connection to the pattern of attacks on Ambazonian students, activists, and community leaders which have worsened over the past year. Three days later, ten more unarmed Ambazonians and one Ghanaian pastor who was working with them were slaughtered in the town of Batibo. Though this news may never have surfaced if not for the connection to clergy in Ghana, organizations such as the Network for Human Rights Defenders in Central Africa have begun to analyze, document, and report on these incidents. Several Pan-African groups, including affiliates of the prominent Network of African National Human Rights Institutions (which share a collegial relationship with the Pan African Nonviolence and Peace-building Network), have raised growing concerns about military-perpetrated, government-instigated violence in the area which makes up the southern border of Cameroon and Nigeria. Nonviolence has always been the strategy and philosophy of choice there, with the decades-long freedom slogan focusing on the logic of Ambazonia freedom, by “the force of argument, not the argument of force.” In1961, the United Nations Trust Territory of Southern Cameroons voted for full independence from colonial Great Britain, and neighboring Francophone Cameroon quickly incorporated the territory into its own “United Republic” of Cameroon. Since that time, a mass, unarmed civil resistance movement has declared its desire for full independence, given its distinct languages (English and Indigenous African), culture, history, and geographic base. In 1984, when Cameroon President Paul Biya removed the “United” from the official name of the country, an even more intense crisis ensued. “All this time, however, from the 1960s until 2017,” noted Eben, U.S. facilitator of the Ambazonian Prisoners of Conscience Support Network, “barely a single stone was thrown as part of our resistance. Armed resistance was never a tactic we engaged in. Following a series of lawyer-led uprisings which began on October 1, 2016, escalating nonviolent civil resistance, and a massive general strike in September 2017—met with gunfire from Cameroon government helicopter gunships—some Ambazonians did initiate an armed struggle on October 1, 2017, declaring independence and setting up a government in exile. Cooperation between the governments of Nigeria and Cameroon might play a negative role in the aspirations of Ambazonians, as Nigeria handed over some who were taking refuge there, and who now make up a growing political-prisoner population in Cameroon. Ironically, Amnesty—widely seen as the unquestioned expert on human rights in the region—has been slow and significantly misguided in reporting the facts of events in the region. An incredibly detailed and well-documented critique of the June 2018 Amnesty International report on “Anglophone Cameroon” spotlights ways in which the respected organization has misunderstood and distorted the reality of Ambazonian life and struggle. The popular refrain that there “is violence on both sides” not only gives too much emphasis to a very limited armed struggle, dismissing the decades of previous history, it also ignores the fact that the last two years have seen a sharp increase in the breadth and scope of nonviolent civic engagement on the part of Ambazonians, both in the territory and in diaspora. An entire network of home-front media producers has congealed around a Southern Cameroon TV project, dozens of diaspora organizations have formed and successfully pressed for attention from local and national politicians, the Southern Cameroons Congress of the People was formed as a political party, and a veritable social media army has begun to link refugees, political prisoners and their supporters, home front organizers, and those living abroad. Independent internationalists might be especially confused by the July 19, 2018 briefings and commentaries issued by Human Rights Watch (HRW). On the one hand, their poignant report “These Killings Can Be Stopped” recounts in 59 detailed pages how the area “is slipping into a protracted human rights crisis in the largely Anglophone North-West and South-West regions that border Nigeria.” It documents how, for the past two years or so, the Cameroon government has responded to demonstrations, legal challenges, and unarmed protests with “heavy clamp-downs,” “repression and arrest,” and “abuse” which likely caused a radicalization on the part of the Ambazonian freedom movement. On the other hand, in HRW’s summary press release sent out the same day, “Cameroon: Killings, Destruction in Anglophone Region,” they misleadingly and inaccurately assert that “in response to protests and violence by armed separatists, government forces have killed civilians, used excessive force against demonstrators, tortured and mistreated suspected separatists and detainees, and burned hundreds of homes in several villages.” Want to find evidence that the HRW summary press release is inaccurate? Read the HRW full report! The poor attempt to be “even-handed” tragically dilutes HRW’s basic good point: these killings can and must be stopped—by support for justice-seeking nonviolent campaigners and a condemnation of government-based military violence and oppression. The crisis in Ambazonia—like so many anti-colonial crises that seem to be escalating in this age of neocolonialism—cannot easily be resolved, especially by traditional military or diplomatic means. As grassroots women’s and social groups inside the country and supporters or allies in the Diaspora continue to put pressure on the colonial regime, unarmed civil resistance is the best hope for lasting change. But change cannot take place without clear, pro-justice, international attention and support—which so far has been sadly lacking. European Union Steps In After Cameroon’s Death Penalty Charge On Kamto. 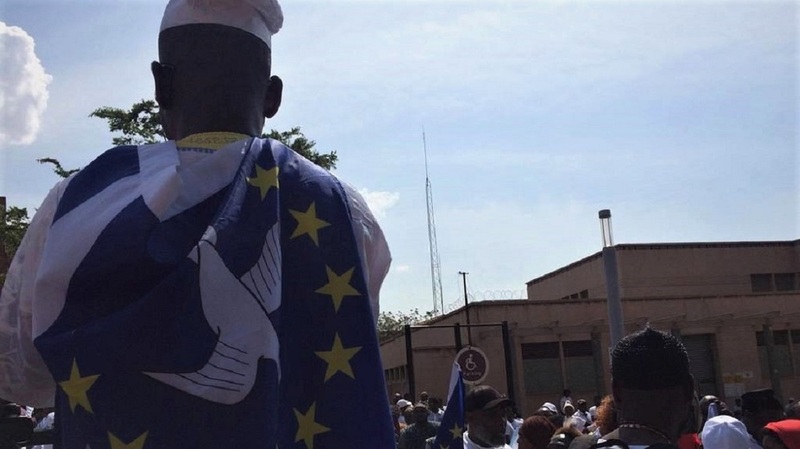 The European Union has issued a statement calling on the Cameroon Government to take appropriate steps in solving the political crisis that erupted a few days ago in the French-speaking Regions of the country. According to a communiqué the European Union through its spokesperson for Foreign Affairs and Security Policy/European Neighbourhood Policy and Enlargement Negotiations has enjoined the Cameroon Government. Maja Kocijancic condemned, Thursday, January 31, 2019, in Brussels, Belgium the political situation unfolding in Cameroon where rallies occurred leading to use of disproportionate force by the police and to arrests, including leaders of the main opposition party. The Spokesperson states that EU has also observed violence against Cameroon’s Embassies abroad, adding that only dialogue in an atmosphere of inclusivity and serenity, where fundamental right and state of law are respected will solve a problem. Prof Maurice Kamto, Chair of Cameroon’s main opposition political party, Cameroon Renaissance Movement (CRM) was officially charged on eight (8) counts including facing a death penalty, the party’s third Vice President, who’s also the party’s Advocate, Barrister Emmanuel Simh told National Telegraph late Thursday, January 31, 2019. Kamto was transferred from the Judicial Police Headquarters in Elig-Essono in the nation’s capital, Yaoundé where he was initially held to the Special Operation Unit of the Police, GSO at Carrefour Mvan still in Yaoundé, before he was interrogated and charged on eight (8) counts, Wednesday, January 30, 2019. Maurice Kamto has been charged with Rebellion, Sedition, Insurrection, Inciting Violence, Disruption of Public Peace, Complicity, Association with wrongdoers and Hostility against the nation, Simh told National Telegraph’s Eric Tataw on phone from the country’s capital, Yaoundé, adding that the charge on Hostility against the Nation is tantamount to Death Sentence. On Saturday, January 26, 2019, at the behest of Kamto, Cameroonians observed peaceful demonstrations in Douala, Yaoundé, Bafoussam and in other cities. A mammoth crowd attended the protest, denouncing what they term Electoral Holdup. Abroad, many Cameroonians who were protesting invaded Cameroon Embassies in France, Belgium, Britain, and Germany causing material damages. In Cameroon, several protesters were reportedly shot by police, including Michele Ndoki, a famous female lawyer. Kamto had challenged the results at the country’s Constitutional Council where the Council’s ruling was considered by many Cameroonians as jaundiced. Kamto believes the Electoral Commission imputed figures to favour the incumbent especially as elections were boycotted in the North West and South West Regions buried in an armed conflict. Others have accused Biya 85, in power since 1982 for desperately holding to power. As a result, Prof Maurice Kamato, his closest party aides and allies, Christian Penda Ekoka, Albert Dzongang and, several other party activists were arrested at about 9:30 PM, Monday, January 28, 2019, at Albert Dzongang’s Residence situated at Mobile Guinness neighborhood, of Douala III Sub-division, Wouri Division in Cameroon’s Littoral Region. They were later ferried to Yaoundé where they’ve been charged and expected to stand trial. Amnesty International had earlier called for their unconditional release. The accusations have however also been condemned by Kamto’s college of lawyers amongst whom are Barristers Silvain Soup and Emmanuel Simh, who say an arreste cannot be charged before his court appearance.